Gear up for Spring adventure with discounts on Marmot apparel and equipment. Marmot is an outdoor clothing and sporting goods company founded in 1974 to produce the best outdoor equipment which meets the expectations of mountain professionals and enthusiasts alike. Deal of the Day: Save up to 40% off Coleman Camping Gear 12/08/2017 only! Save big on Coleman camping gear for the Holidays! Deal of the Day: Save Big on Coleman Father’s Day Gifts and Summer Fun for 6/12/2017 only! Discount only applies to select items shipped and sold by Amazon.com which are eligible for Free Returns. 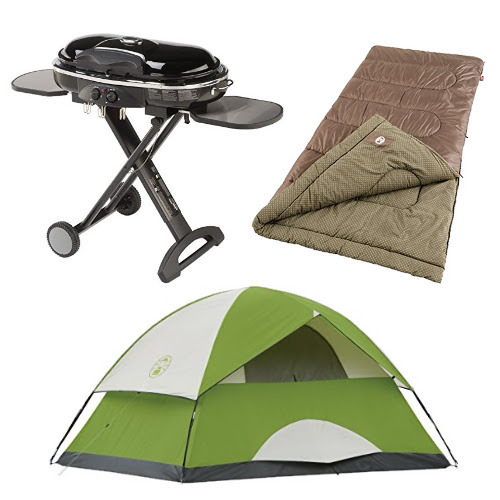 Deal of the Day: Save up to 30% on Coleman Camping Favorites for 4/11/2017 only! Now the snow has melted and spring is in full bloom. There is nothing like being outside to enjoy nature at it fullest. Camping outdoors has always been a way to enjoy nature at its finest! Coleman has all the amenities to make your adventure more pleasurable. Deal of the Day: Save Up to 58% on Spring Coleman Gear for 3/31/2016 only! More than 100 years ago, a young man with an entrepreneurial spirit and a better idea began manufacturing lanterns in Wichita, Kansas. His name was W.C. Coleman. The company he founded would change life in America. A fascinating saga, if we do say so ourselves. One filled with historical significance, amazing innovations and delightfully fun things to know. Our current catalog is thick with recently introduced products that make spending time outside a pleasure. There are products just for kids. Coolers that keep food and drinks cold for up to five days. Powerful, portable, propane grills that you can take anywhere or just use in your backyard. An accessory line with more than 100 separate items. See www.coleman.com for links to our websites around the world. As an international leader in the innovation and marketing of outdoor products, The Coleman Company, Inc. helps people have fun and make memories by providing the gear integral to their favorite outdoor experiences. The company’s products include its legendary lanterns and stoves, as well as coolers, tents, sleeping bags, airbeds, backpacks, furniture, and grills under the Coleman® brand. Additionally, the company provides flotation devices, towables, rainwear, waders, hunting and fishing gear as well as safety and survival equipment under its Stearns®, Sevylor®, Sospenders®, Hodgman®, Mad Dog Gear®, Helium® and Aerobed® brands. Founded in 1900 and based in Wichita, Kansas, Coleman is a wholly owned subsidiary of Jarden Corporation and can be found online at www.coleman.com.